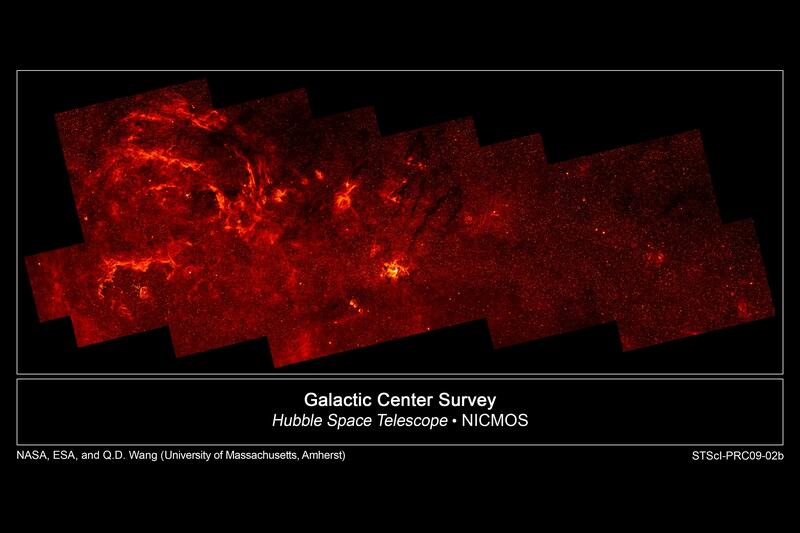 Peer into the mysterious heart of our galaxy’s center. Typically obscured by gas and dust, the central Milky Way is revealed in this new image taken by the Hubble Space Telescope. The picture appears red because it was taken using infrared light, which can pierce through opaque dust clouds. The panoramic view captures a scene full of massive stars, complex structures and hot, ionized hydrogen gas. Winds and radiation from giant stars carve out strange shapes in the gas and dust seen throughout the image. 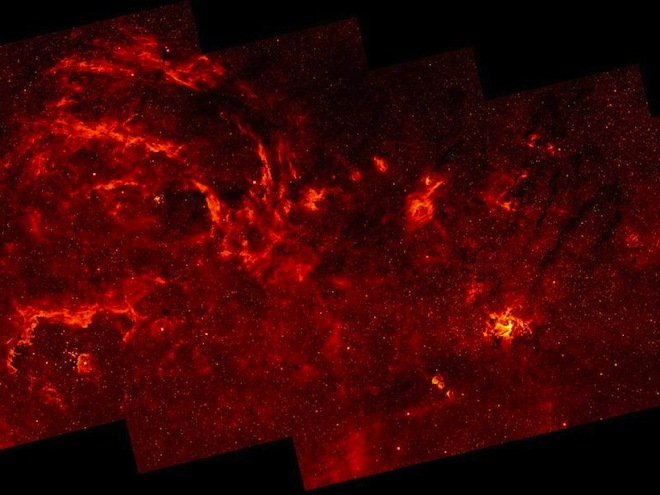 In the upper left, large arcs of ionized gas form ghostly filaments, indicating influence from strong galactic magnetic fields. The lower left shows pillars of gas sculpted by wind from the hot massive stars of the Quintuplet cluster. The image also reveals populations of massive stars strewn throughout the central region. These glowing objects are anomalous because they are not confined to the central clusters where stars typically form: the Arches cluster, Central cluster and the Quintuplet cluster. The newly discovered stars may have formed independently of these regions or they may have been thrown out of the main clusters by chaotic gravitational interactions. In the lower right side of the image, ionized gas can be seen in a bright spiral surrounding the supermassive black hole at the galactic center.